FREE anniversary celebration for the very popular Wings Plus Lunch Cruise! SPECIAL EVENING HOURS and block party that’s open to all classic, custom, or cool! Food and drink specials all night, plus special beer, burger, and hot dog stands outside set up for all to enjoy. Special gift certificates on the evening for 1st, 2nd, and 3rd place as chosen by management. Raffles and prizes, DJ/MC Rockin Rich Bedford, LIVE www.rollbackradio.com broadcast, face painting for the kids, 50/50 raffle, and the best wings anywhere! GATES OPEN AT 4pm! Special show hours 5-9pm. Thank you for making the Wings Plus Lunch Cruise one of the most popular classic car events in south Florida! 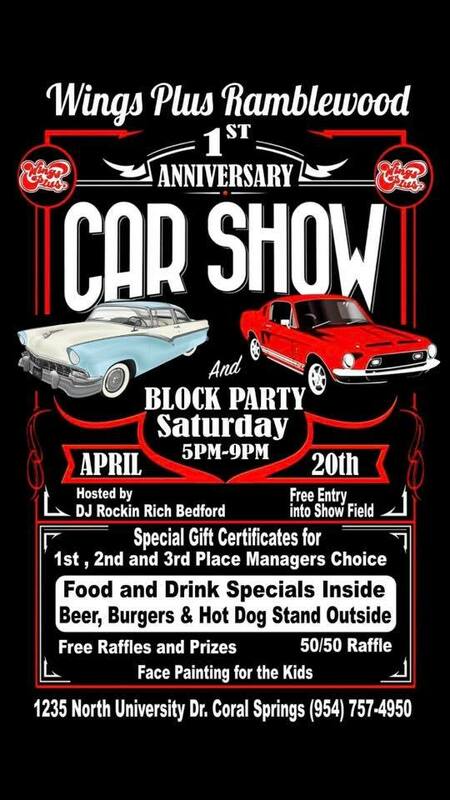 Rockin' Rich's events packages includes a four hour classic car show DJ music program (extra hours available for additional hourly rates) & Rich as your personal concert emcee! We can even get you the groups and artists! The "Three Hour Cruise Night" deal for your business (restaurant, bar/grill, ice cream shop, etc.) is perfect! 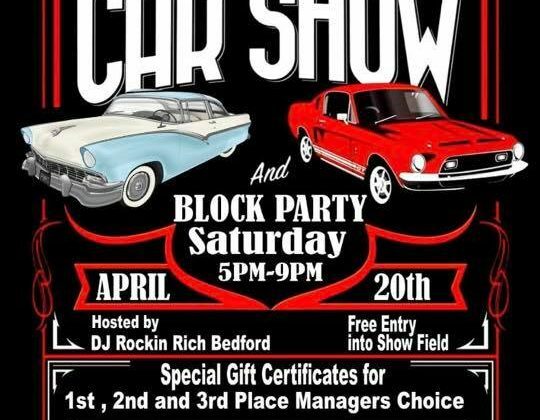 You get DJ Rockin' Rich Bedford, parking lot set-up and management, flier distribution, instant business as well as future business. All right reserved © Copyright 2014 | RockinRich.net designed & sponsored by Autogeek.net.